Mini Converter SDI to HDMI converts from SDI to HDMI video with embedded HDMI audio, plus balanced AES/EBU or analog audio. Imagine using big screen televisions and video projectors for broadcast video monitoring! Now you can easily connect HDMI displays to SDI based equipment. Mini Converter HDMI to SDI is ideal for converting from HDMI devices to SDI video with the choice to embed SDI audio from HDMI, AES/EBU or balanced analog audio inputs. Now you can add SDI outputs to cameras with HDMI connections, or if your computer supports HDMI compatibility via DVI to HDMI adapters, then you can add SDI outputs to computers. Mini Converter SDI to HDMI converts from SDI to HDMI video with embedded HDMI audio, plus balanced AES/EBU or analog audio. Imagine using big screen televisions and video projectors for broadcast video monitoring! Now you can easily connect HDMI displays to SDI based equipment. 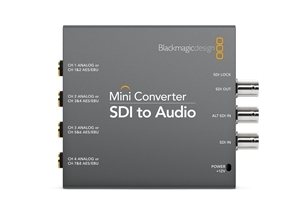 Mini Converter SDI to HDMI converts from SDI to HDMI video with embedded HDMI audio, plus balanced AES/EBU or analog audio. Imagine using big screen televisions and video projectors for broadcast video monitoring! Now you can easily connect HDMI displays to SDI based equipment. Perfect for converting from analog HD/SD component, NTSC, PAL or S-Video to SDI out with balanced jack AES/EBU and analog audio embedding. 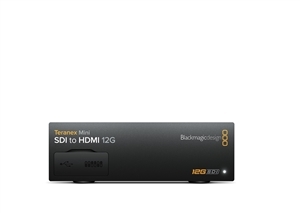 Now you can convert analog devices such as Betacam SP, VHS, set top boxes, gaming consoles and HDV cameras to incredible quality SD/HD-SDI video. Convert an HDMI input to SDI output. Convert HDMI camera outputs to SDI for longer cable lengths and professional connectivity on location. 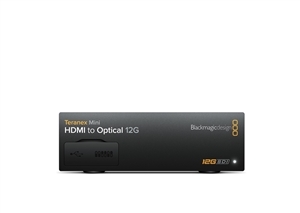 Includes SD/HD auto switching and features dual SDI outputs. Includes a built-in lithium-ion polymer rechargeable battery and power supply. Mini Converter SDI to HDMI 4K includes everything you need to convert from SD, HD, 3G and 6G-SDI video sources to HDMI in SD, HD and Ultra HD video formats. You can also de-embed SDI audio to HDMI, AES/EBU or balanced analog audio out. Imagine using big screen Ultra HD TV’s and projectors for broadcast monitoring! The built in down converter even allows Ultra HD monitoring on HD televisions! Convert from analog component,S-Video or composite to SDI. Includes SD/HD auto switching, redundant SDI output, plus analog or AES/EBU audio embedding. Convert from SDI to analog component, S-Video or composite. Includes SD/HD auto switching, redundant SDI input, plus analog or AES/ EBU audio de-embedding. Convert from HDMI to SDI. Includes SD/HD auto switching, redundant SDI output, HD to SD down conversion, plus analog or AES/EBU audio embedding. Convert from SDI cameras and decks to HDMI monitors and projectors. Includes SD/HD auto switching, redundant SDI input, plus analog or AES/EBU audio de-embedding. 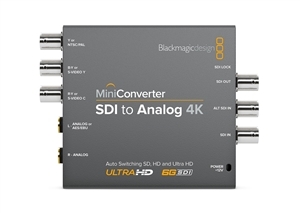 Convert SDI in SD, HD or Ultra HD to analog video with down converter and audio. Mini Converter Heavy Duty models are machined from a solid block of aircraft grade aluminum so they are super tough and durable enough to be used in the most demanding live production and outside broadcast environments. Convert SDI in SD, HD and Ultra HD to HDMI 4K with analog and AES/EBU audio. Heavy Duty Mini Converters are machined from a solid block of aircraft grade aluminum so they are super tough and durable enough to be used in the most demanding live production and outside broadcast environments. Convert SD, HD and Ultra HD HDMI video with HDMI/analog or AES/EBU audio to SDI. Mini Converter Heavy Duty models are machined from a solid block of aircraft grade aluminum so they are super tough and durable enough to be used in the most demanding live production and outside broadcast environments. Mini Converter SDI to HDMI converts from SDI to HDMI video with embedded HDMI audio, plus balanced AES/EBU or analog audio. Imagine using big screen televisions and video projectors for broadcast video monitoring! Now you can easily connect HDMI displays to SDI based equipment. 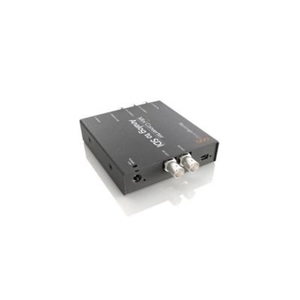 Independent bi-directional 6G-SDI to optical fiber and optical fiber to 6G-SDI. ncludes everything you need to embed 4 channels of analog audio, or 8 channels of AES/EBU digital audio into any SDI video connection. Embed audio from devices such as audio mixers and analog decks into SDI video connections for use with SDI routers and decks or to add extra audio channels to video converters! Broadcast Converter combines most mini converters features into a 1 rack unit chassis that allows bi-directional conversion. Convert SDI to analog/HDMI while at the same time converting analog to HDMI to SDI. Broadcast Converter is a complete solution for connecting analog decks such as Betacam SP to SDI based systems in a compact rack mount design. Teranex Express, is the world’s first real time SD, HD and Ultra HD broadcast up and down converter! Featuring advanced patented algorithms, Teranex Express gives you the visually transparent quality conversions and are mandated by major broadcasters and studios worldwide! 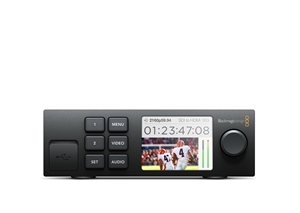 You get an incredible 178 SD, HD and Ultra HD up and down conversions in full 10-bit quality complete with embedded audio, closed captions, timecode and more!